I'm self-taught in the art of carving stone, and am always open to learning more about it. I began as a woodcarver, but was soon drawn to soapstone carving, realizing that this material offers strength and a certain amount of permanence in a fast-changing world. I enjoy the challenge of producing a carving that will showcase the grain and strength of each particular stone, always striving for excellence in craftsmanship. Over the years I have experimented with a variety of different methods of combining soapstone with other materials, adding new dimensions to my carvings. Carving wood, and then soapstone, began as a hobby over 40 years ago, while I pursued my career as a lithographic stripper, but it has become a full-time, year-round business now that I am retired. 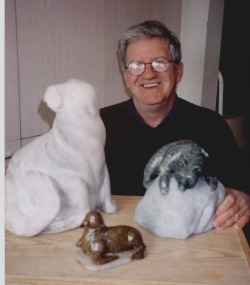 I have been involved in many art and craft shows, from North Bay to Toronto to Windsor, and my sculptures have found homes in over two dozen countries around the world. Over the years I have had the opportunity to share my experience with others, having taught many students at schools in the Muskoka area, as well as adults in a variety of locations such as the Wye Marsh and "The Rosseau, a JW Marriott Resort & Spa". I do enjoy having former students come to see me at craft shows to show me carvings they have made, and to share what is going on in their lives. You can see the list of shows in which I am involved this year on the Where You Can Find Us page. I enjoy the opportunity I have at the shows to meet potential clients, and other artists, and to share my craft.